Baby vomit. It's nothing to laugh about... unless you're married to this poor dad! Baby vomit. It’s nothing to laugh about… unless you’re married to this poor dad! Nothing smells quite as bad as baby vomit. Just ask Ben Patterson. He is the father behind the epic battle with baby spew that escalated from funny to flipping hilarious in a matter of minutes. 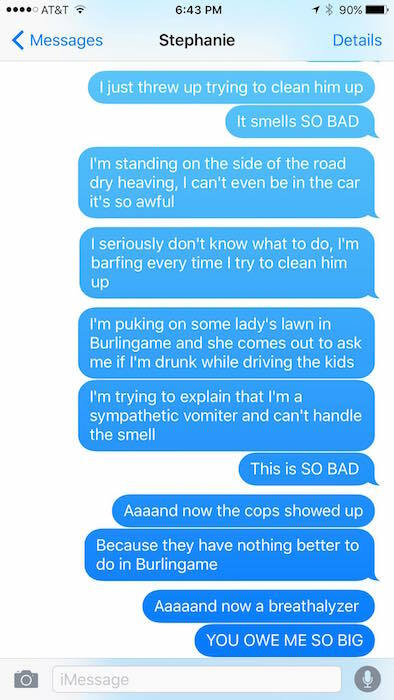 Come and read why his plea for help to his non-responsive wife via SMS will go down in history as quite possibly the funniest text message thread ever. Parents are known for posting plenty of pictures and sharing several stories of their kids via social media. Earlier this week, father Ben Patterson shared a simple photo of his son and a text message thread to his wife that all parents need to read. 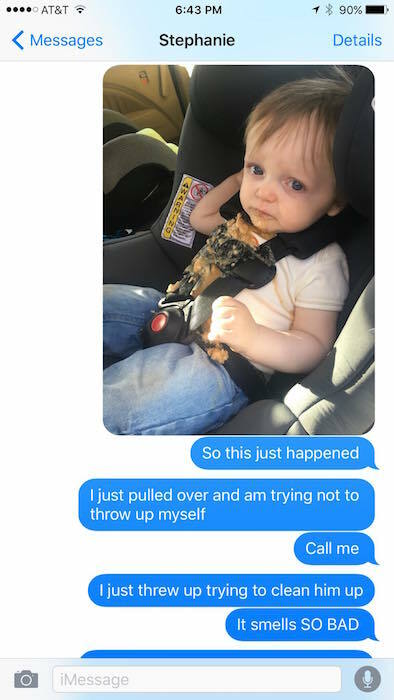 What started out with the classic projectile-vomit-in-the-car scenario turned substantially wrong for Ben when he was unable to stomach the car seat mess. As Ben attempts to clean up his son, Declan, he starts to sympathy spew in a stranger’s front yard. The concerned stranger comes out, accuses him of drink driving and calls the police. Ben is then breathalysed, all the while trying to get into contact with his wife and stop his son from vomiting. Ben ends his epic adventure by driving home with the windows open trying to hide from the smell of rotting whale rubber. It sounds made up. It’s not. Here’s the proof. As if the whole scenario isn’t already hilarious, it’s Stephanie’s reaction that makes it even better. While Ben is knee deep in baby spew and breath tests, Stephanie does what any sane mum would do. 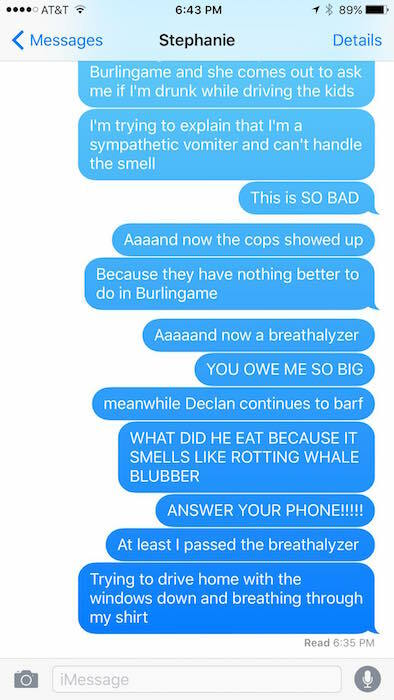 She ignores the messages and doesn’t pick up her phone (I like to pretend she is in a fit of laughter relaying the messages to a friend over a bottle of wine but that’s just me). Thank you Ben, for posting this hilarious thread. While his car may permanently smell like puke, at least he will have a story to tell for years and years to come. And, at least he passed the breathalyser.